What do you say to friends and co-workers who lost their job in a large downsizing at your company? That was my dilemma last week. I was torn with emotions. Relief and happiness that I was not one of the people to be terminated. Despair for those who were. Even a little guilt thrown into the mix since I guessed it was coming but could not say anything or I would have lost my job too since I’m in the Legal Dept and confidentiality is absolute. When you think about it, Monday to Friday you likely spend more waking hours with your co-workers on a daily basis than you do with your spouse or family so their leaving is going to be adjustment for all people concerned not just those that are gone. The day after everyone left my workplace felt almost like we were at a funeral. The remaining employees, me included, were still an emotional wreck. I think there may have been more tears that day than the prior. When we were informed of the terminations people were in a state of shock but by the following day reality had set it. We were no longer going to be sharing stories and having coffee breaks with the people who had shared our lives for so long. We were in essence grieving over the loss of our friends and co-workers. Nothing profound or terribly inspirational came out of my mouth last week but I hope those that I did talk to understand what I was trying to convey. Quite simply, that they aren’t alone and life will go on. Well after months of training “sort of” it was finally here, the Tower of Terror 10 mile race weekend (race day was October 5, 2013) and I was so looking forward to it. I said training “sort of” because I started out training a lot but then I joined roller derby and my runs seemed to get fewer and farther in between. My longest training run to date had been just less than 8 miles and here I was heading off to run 10. It was a daunting thought but I was up for the challenge or at least I hoped so. This was also going to be the first trip to Walt Disney World Resort (“WDW”) for my husband and I without the kids. It was a novel experience planning it without first considering what the kids wanted. We could finally do some of those adults only things we’d talked about. 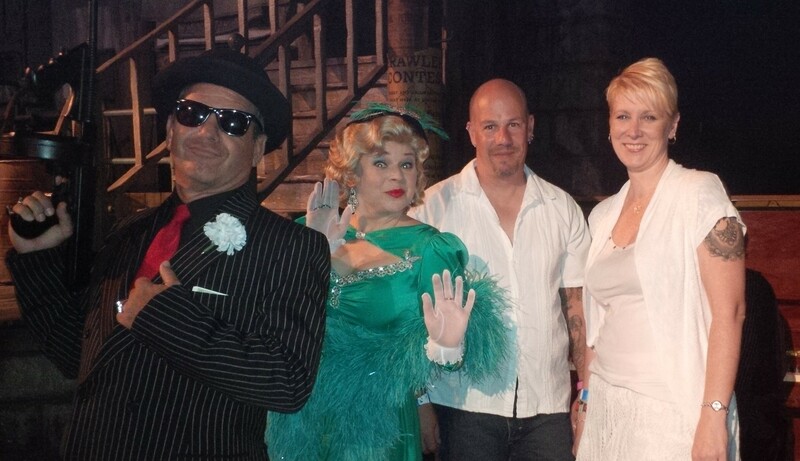 As luck would have it that weekend WDW Radio was hosting an event with dinner inside the Great Movie Ride, but that is a story for another day. My husband is a bit of a daredevil and has bungee jumped before but I am terrified of heights and would never consider such an adventure. 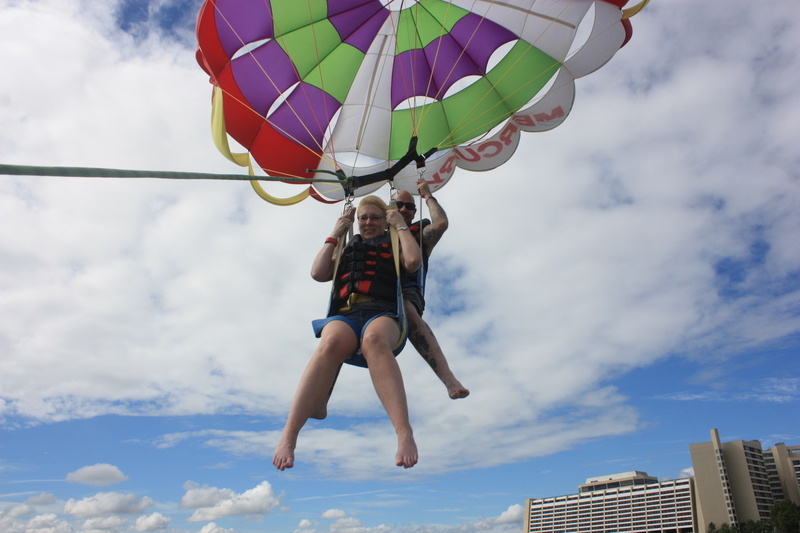 Well, somehow I talked myself into conquering my fear of heights and going parasailing. It was one of those things my husband had always wanted to do so I signed us up as part of my anniversary present to him. The day we were to parasail dawned clear and bright and with it my fears returned with vengeance. Could I really do this? Could I allow myself to go 400 feet up in the air and watch my feet dangle with nothing below me but Bay Lake? Wayne was determined, he was going with or without me so off we went and checked in at our scheduled time. I was so scared at this point but knew I could back out up until the last possible moment on the boat. I allowed myself to be put in the harness and listened to all the instructions. It was suddenly go time and it all happened so fast I didn’t have time to think about chickening out. We were attached to the parasail which was already deployed out behind the boat and up we were going. It was surreal. I still get chills thinking about it. We were on the deck of the boat and literally 10 seconds later we were 400 feet up in the air. The ascent was fast, but not shockingly so, and it was so smooth. I admit I was hanging on pretty tightly at first but I managed to relax somewhat as time went on. Looking around and seeing Magic Kingdom Park from that point of view made all the nerves worthwhile. It was an experience I will never forget. Unfortunately our GoPro camera died that day so we didn’t get any pictures from up in the air of the amazing view. I’m not sure I would have gone up had it not been for Wayne and his support that day. However, having done it once now, I would gladly do it again. To anyone who is thinking about parasailing at WDW I would highly recommend it. The staff at Sammy Duvall’s Watersports Centre were professional and amazing. They seemed to realize the more time they gave me to think about it the bigger the chance I would back out. Parasailing day also happened to be race day. We had decided early on that after parasailing we would take it easy so I wasn’t exhausted before the race even started but there was just no way I could be that close to Magic Kingdom Park and not go in to ride at least a few rides. One of the rides we decided to tackle was Big Thunder Mountain. For me this was another scary proposition. I am not a fan of roller coasters, but again I mustered up my courage and plunged head first into an abandoned mine on a runaway train car. When it was done I was pleasantly surprised. It had not been that bad after all. 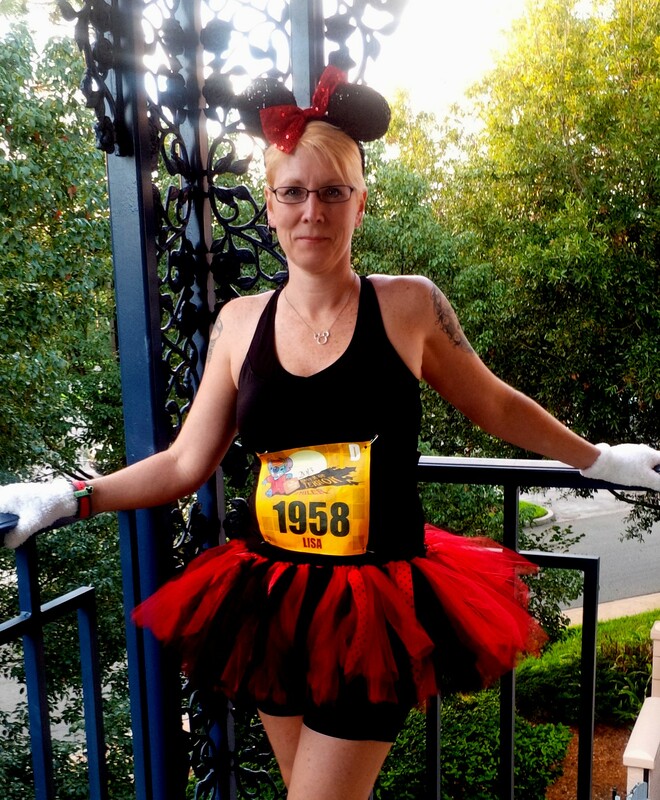 As race time approached I put on my running costume, Minnie Mouse. For the third time that day I was getting nervous about doing something I’d never done before. 10 miles is not exactly a short race. While I realize it’s certainly not a marathon, it’s nothing to look down your nose at either. Having never done a runDisney race before, or any race with more than 100 participants, I did not know what to expect and decided to head to the staging area early. This was probably the only thing I would do differently next time. I did not need as much time to get organized as I allowed myself. Hopping on the bus and heading to the staging area was an experience all its own. 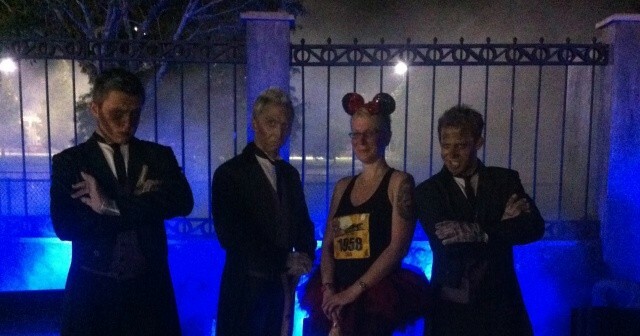 I never expected to see 80% or more of the runners dressed in costumes. A few crazies like me but not almost everyone. The build up to the race was great, with all the music and fireworks. Based on race times I submitted for previous 10km races I’d run I was placed in corral D which rather surprised me but I was happy to not be in the last corrals and have to worry about keeping ahead of the balloon ladies. I was not expecting this to be a fast race for me for a few reasons: 1. I’d never run this far before; 2. I knew I was going to stop and take a lot of pictures along the way; and 3. I’d never run in such heat. It was still 27°C with high humidity at 10pm when the race started. The race started out well and I was pretty happy with my pacing. The character stops for pictures were almost perfectly timed for when I needed to slow down and take a break. By about mile six I was starting to fade and the heat was getting to me but I was drinking lots to stay hydrated. I think this was the point in the race where we were on a dirt/gravel path headed into the ESPN Wide World of Sports Complex. The lights had gone out on part of this path and it was rather difficult to see. A rock got wedged up in the sole of my shoe and I had to get out of the way of other runners so I could stop and remove it, all in the dark. At mile eight I hit “the wall”. I thought about quitting but knew I would hate myself if I did so I pushed on. My husband who was getting status updates on my time told me later that he was starting to worry a little as he watched my interval times get slower. Somewhere around mile nine we were entering Hollywood Studios and I knew the end was near so I caught a second, third or maybe even fourth wind at that point. 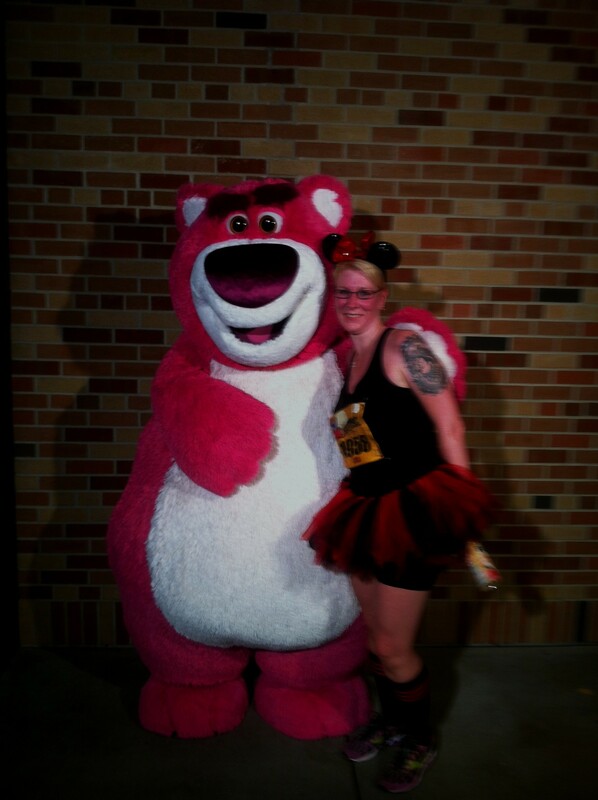 I ran around a corner by the back lot and there was Wayne cheering me on. I was so happy to see him I almost cried. I remember thinking I must really be getting close to being done and around the next corner must be the end, but it wasn’t. There were still more photo ops to stop for before the finish line. It seemed like the run through Hollywood Studios would never end but alas it finally did. My time was 2 hours 20 minutes. I accepted my medal and box of snacks and made my way to bag pick up while eating my banana. Never had a banana tasted so good to me. I did it. 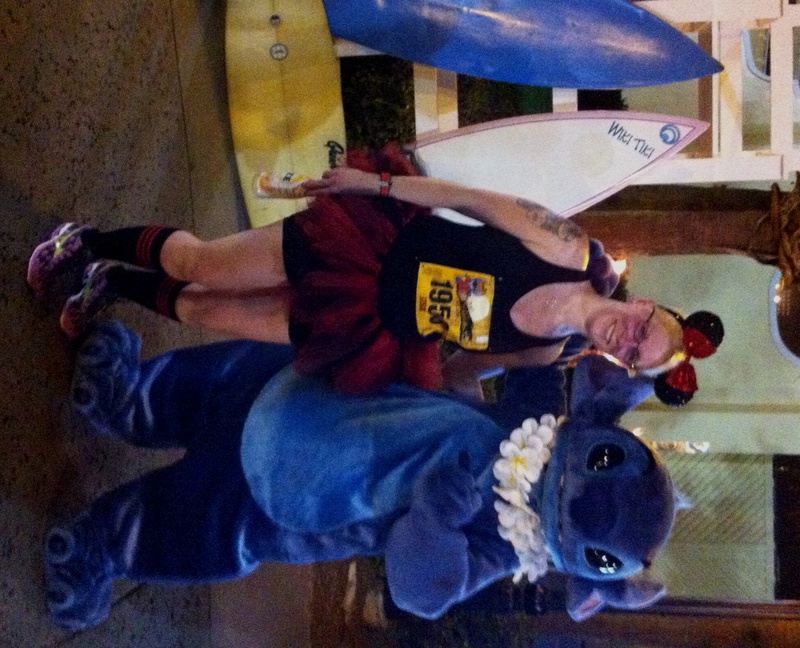 I had run my first runDisney race and my first 10 mile race. I was exhausted and a little sore but overall happy with my performance based on the conditions and my now very apparent lack of training. Actually I was thrilled with myself. I was 41 and not even a full 10 months earlier I ran for the very first time after leading a rather sedentary life for quite a number of years. I was pretty damn proud of myself. After the race I met up with Wayne and we headed to the Toy Story Midway Mania ride. It is one of my favorites and the lines are usually long so I had to take advantage of the chance at a short line. The line was not short (or fast) enough for Wayne. Imagine if you will, an enclosed building with 100’s if not 1,000’s of sweaty racers who were either in line or had recently been in line. Me, being one of those sweaty racers hardly noticed the “aroma” present as we waiting in line but Wayne, who has a super sensitive nose and who did not run was quite literally gagging every time we entered a confined hallway and there was movement making the scent waft around us. He could not get out of there fast enough. I must admit at 1am after having run 10 miles I found his discomfort rather amusing. We didn’t stick around long at the after party as it had been a very long eventful day. Back in our room as exhausted as I was I just could not sleep. I was so exhilarated with everything I had done and accomplished. I’d conquered by fear of heights and parasailed. I’d set aside my fear of roller coasters and ridden Big Thunder Mountain and I’d not given up and run my first ever 10 mile race. It was the most empowering day I think I’d ever had. I felt like I could take on the world. I can’t sufficiently put into words just how emotional I was that night and what all I was feeling but suffice it to say I was amazed at myself. I sincerely hope a trend started that day and I can continue to face my fears that have been holding me back and continue to enjoy all that life has to offer.